The Hamstring Stretch flexibility and stretching exercise increases your range of motion when you flex your knee and extend your thigh. This motion is essential for walking. Biceps femoris - Flexes your knee and the long head extends your thigh. Semitendinosus - Flexes your knee and extends your thigh. Semimembranosus - Flexes your knee and extends your thigh. Keeping these muscles healthy will help you stabilize and strengthen your knee and hip joints. Sit sideways on an exercise bench or two chairs placed side by side. 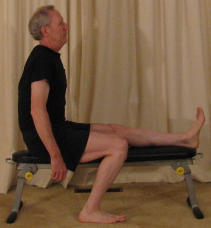 Extend your left leg straight out on the bench with your toes pointing up. Place your right foot flat on the floor. Don't slouch and keep your back straight. If you feel a slight tightening of the muscles in the back of your thigh, hold this position for 10 to 30 seconds. If you don't feel these muscles tighten, lean forward from your hips until you do. Repeat this procedure with the right leg. Repeat 3 to 5 times on each side. You can do this exercise once or twice a day. 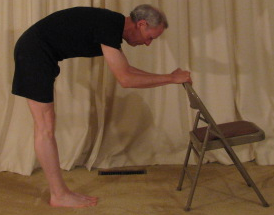 Stand behind a chair while holding the back of the chair with both hands. While keeping your back straight, bend from your hips. When your upper body is parallel with the floor, your should feel tightening in the back of your thigh. Repeat this exercise 3 to 5 times.